Traveling with a disability can be challenging and stressful. You're always wondering if an accessible taxi will show up at the hotel on time or whether you'll have to navigate a flight of stairs to the restaurant's bathroom. When you choose a cruise for your vacation, it is possible to eliminate some unwanted surprises and reduce the level of stress. 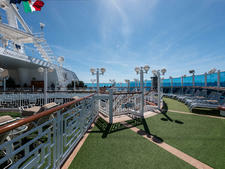 Cruises provide the traveler with more control of the situation in a structured environment. Cruise ships, even vessels sailing under foreign flags, that dock in U.S. ports are required to abide by the Americans with Disabilities Act (the law doesn't apply to international ports). You'll find wheelchair-accessible cabins, public bathrooms, theaters and restaurants. The newest ships go even further to make more ship amenities available to passengers with limited mobility and other disabilities. A cruise can be a rewarding and enjoyable vacation for travelers with disabilities, but it's imperative to do your research and planning before setting sail. 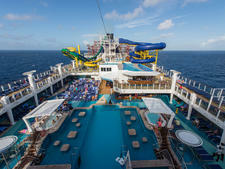 Here are our tips to make the most of your vacation at sea. Accessible features vary from one cruise line to another, and even ships within the same class can be different. When choosing a ship, newer and larger is generally better, but don't discount older vessels. Many cruise lines use the opportunity to make ships more accessible to travelers when they undergo major renovations and upgrades. While oceangoing vessels tend to be more disability-friendly, some river cruise ships are also able to accommodate passengers with disabilities, but with limitations. Most lines also have dedicated departments to assist passengers with disabilities. They can advise the size of a ship's stateroom doorway and whether or not you will need a collapsible wheelchair or scooter. This department can also notify passengers which areas, if any, will not be accessible by wheelchair or scooter and if it's possible to travel with a seeing-eye or hearing-assistance dog. For example, Celebrity Cruises will even help arrange for transportation from the airport to the pier and then assist with boarding. Celebrity's customer service and reservation agents are also Certified Accessible Travel Agents (CATA) with Special Needs at Sea, a company that rents mobility and medical equipment to cruise passengers. With this knowledge, they can assist in getting the appropriate equipment onboard the ship for their passengers. Disney Cruise Line also offers assistance for special needs passengers and provides various items like Communication Kits containing door knock and phone alerts or bed rails, upon request. You can find some of this information by searching "Accessible Cruising," "Accessibility" or "Guests with Disabilities" on a cruise line's website. Not all lines include specific details on their site. Some also have a limit on the number of wheelchairs or scooters allowed onboard a ship at one time, so start planning your trip well in advance by calling for information related to your situation. Once you're booked, the line's accessibility department will ask all passengers with disabilities to complete a form describing their limitations and needs -- the more information you can share and the earlier you submit it, the better. 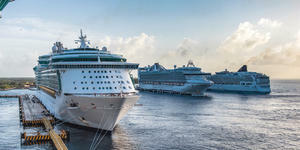 For example, Royal Caribbean requires 60 days' notice before sailing for passengers requesting sign language interpreting services and 30 days' notice to provide such items as a shower stool or commode seat. Norwegian Cruise Line staffs each ship with an access officer, who is the go-to person for passengers with disabilities. Staterooms are usually smaller than hotel rooms, but most cruise lines offer "accessible" and "modified" staterooms. 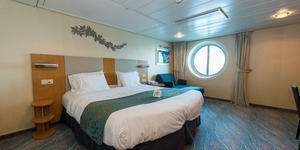 Holland America Line has several types of accessible staterooms. Fully Accessible and Fully Accessible – Single Side Approach rooms are for passengers with no mobility or highly limited mobility. Ambulatory Accessible staterooms have accessible features but are not large enough to accommodate wheelchairs or scooters. Holland America's website lists by ship the number and type of accommodations available with the stateroom location so you can see where you would be in proximity to the elevators, restaurants and other venues. For most ships, only a small percentage of staterooms are fully accessible, which is another reason to book early. Cruise lines generally require passengers to store their mobility equipment (wheelchairs and scooters) in their stateroom. 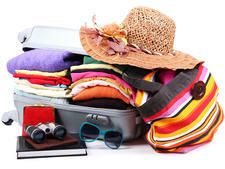 Passengers cannot keep these items in hallways, stairways or public areas because of safety regulations. Read the cruise line guidelines regarding the acceptable width and weight of mobility aids, including the types of batteries and chargers. If you can't or don't want to bring your equipment onboard, consider renting from a provider like Special Needs at Sea or Scootaround. They can provide medical equipment such as wheelchairs, scooters and oxygen. According to Andrew Garnett, president and CEO of Special Needs at Sea, the standard and heavy-duty wheelchairs and scooters they provide will fit through a regular stateroom doorway. If a passenger's weight exceeds 300 pounds, they will have to rent a bariatric scooter, which will require an accessible stateroom door. You may also choose to bring or rent a collapsible wheelchair or scooter for ease in storage and for getting around onboard and when ashore, although Garnett advises that some collapsible motorized equipment may not be as sturdy. Service dogs are usually permitted onboard, but might not be allowed to disembark at all ports. Check with the cruise line to determine what documentation is needed so arrangements can be made to accommodate your dog. Once onboard, don't hesitate to ask for what you need. 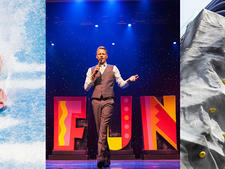 The cruise lines are happy to help, but you have to be specific about what will make your cruise more enjoyable. While ships can be quite accessible, the same isn't always the case for tenders, ports and shore excursions. When a ship pulls into a port of call, passengers cross or walk down a gangway to the shore, and it is often at a steep incline. Sometimes, because of lack of dock availability, the ship cannot dock at specific ports and the ship anchors offshore. In those instances, passengers are shuttled to shore in small boats called tenders. Ask the cruise line about its tender policies if you'll be using a wheelchair or have other mobility issues. Rough seas and other specific conditions may make it impossible for some travelers to leave the ship at specific tender ports. Most lines also have a maximum weight that the staff is allowed to lift to assist passengers (Princess Cruises put the limit at 50 pounds). Princess Cruises also gives a detailed explanation on their website of the embarking and disembarking difficulties for those with limited mobility. The line states that being unable to disembark can be disappointing, but "there will be no refund or credit for missed ports." The maximum weight of the wheelchair including passenger cannot exceed 600 pounds on transportation lifts. "The most common mistake people make is booking a cruise before they research the accessibility of the ports," says John Sage, founder of Sage Traveling. "Often, it turns out there is a ship sailing one week later with a different itinerary, and they could have gotten off at every port. Instead, they have to stay on the ship half the time." 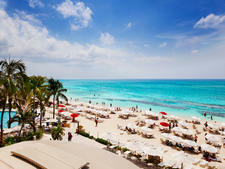 The best advice is to choose itineraries that feature ports of call with cruise piers. Cruise lines offer shore excursions in every port, either included in the cruise fare or for an extra fee. These onshore adventures can range from a day spent hiking in a national park and swimming with dolphins to a leisurely walking tour through a city and hands-on cooking classes in restaurants. Each destination can present unique challenges. Cobblestone streets, like those found in Europe, and uneven walking surfaces are treacherous obstacles for those who have reduced mobility. Even if you are planning to explore a locale on your own, contact the area's convention and visitors bureau to discuss the terrain and availability of wheelchair-accessible public transportation. Some places, such as Halifax, Nova Scotia, have museums, restaurants and art galleries a short walk from the port. The city's impressive Citadel and a lovely Public Garden, however, sit atop hills that might be too steep a climb for someone who uses a wheelchair. All of the lines have become more aware of the need for excursions geared toward a variety of abilities and many offer several options ranging from easy to strenuous. Silversea has recently added accessible shore excursions to its offerings. The guides are familiar with accessibility issues, and these tours avoid the use of stairs and provide vehicles with wheelchair ramps or lifts. 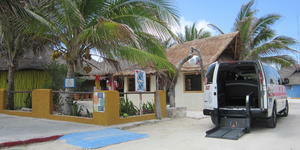 They are currently available in nine ports of call in the Caribbean and Central America. They will be expanding these excursions to the Mediterranean in 2019.
Review online information or contact the line's shore excursion department to determine the physical strength required for any excursion if you are uncertain. There's nothing worse than going out on a group tour and realizing you're not able to keep up. The shore excursion department can also work with you or direct you to someone that can create a semi-private or private tour best suited to your needs and budget. As the population ages and baby boomers retire, cruise lines are improving accessibility and creating an accessible-friendly environment. With these changes, more people who have disabilities or mobility concerns are choosing to cruise. The options continue to grow and advance with the new high-tech ships and significant refurbishment projects of existing vessels. As mentioned before, investigate all of your options, do your research and be sure to book your cruise far in advance for a stress-free and memorable vacation.